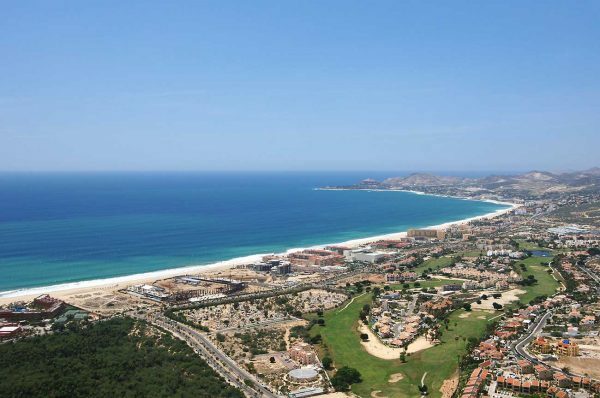 This mile long beach expanse runs from the south side of the San Jose del Cabo estuary next to the Presidente InterContinental All Inclusive Los Cabos Resort ending at the Las Mananitas condo resort development on the south. 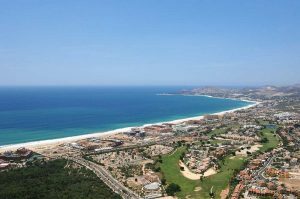 Hotel beach or Playa Hotelera fronts numerous resorts including a new Mayan Palace (completion late ‘07), Royal Solaris Los Cabos Resort, Crown Plaza Los Cabos Beach Resort, Tortuga Bay (under construction) Desire Resort & Spa, and The Grand Baja All Suite Resort & Spa. Aerial photo on right from 2005. The beach is accessible from a path adjacent to the Presidente next to the estuary (parking), as well as in public access corridors found between the hotels. Some of the hotels such as the Royal Solaris will allow non-guests to use their pools and other facilities if you purchase a Day-Pass. Adjacent to the southern most corner of the estuary bordering the Presidente is a fenced-in area where sea turtle eggs are brought in for hatching and release back into the sea. Often visitors can participate in the releases by first checking with the hotel. The fresh water estuary is home to over 300 species of wildlife, was home for local Indian tribes for millennia and a fresh water re-supply source for Spanish galleons, pirate ships and whalers for centuries. You can stroll an asphalt path that runs from the Presidente to downtown San Jose paralleling the river for about a mile. It’s a favorite haunt for bird watchers. Hotel Beach is generally not recommended for swimming due to a steep drop-off, under-tow, and high summer surf due to tropical disturbances originating from the south. Playa Hotelera (Hotel Beach) is fine for beach walks, surf fishing, horse riding or soaking up some sun. Public palapas can be found on the beach below Plaza Garuffi & Caracol (below the Mega store) on the south end of the playa. Above Plaza Garuffi is a lush park with fountains; children’s play equipment and an exhibition soccer field with covered bleachers.